EDMONTON – NAIT researchers will help Alberta innovators develop and test low-carbon energy solutions with a new microgrid research facility, funded by a $2 million grant from the Government of Alberta. 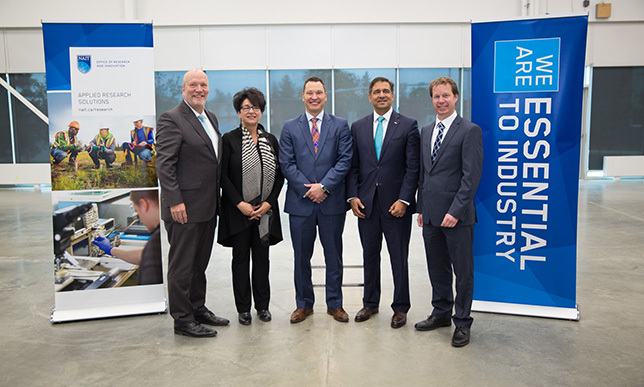 The funding was announced Thursday by Economic Development and Trade Minister Deron Bilous at NAIT’s new Productivity and Innovation Centre. The Distributed Energy Management Initiative, a partnership between NAIT, ATCO, Siemens and the Future Energy Systems research program at the University of Alberta, will provide a “plug-and-play” microgrid where energy companies can test and validate their technologies under realistic field conditions. The facility will help them discover innovative technologies to generate, manage and store energy and reduce or eliminate greenhouse gas emissions. For example, a battery storage company whose products have been used in warm climates might work with DEMI researchers to test its product in cold temperatures. The microgrid lab will be housed in the Productivity and Innovation Centre, NAIT’s new, 17,650 square-metre centre providing solutions for industry, including advanced manufacturing labs, acceleration spaces for business and applied research facilities.